UCaaS and CCaaS for Retail Communications | 8x8, inc. | 8x8, Inc. The retail industry continues to transform, driven by the influence of online sales and big box stores. Retail chains are implementing innovative services to engage with customers across multiple touch points. Brick-and-mortar stores are increasingly offering Buy Online, Pickup In Store (BOPIS) and Buy Online, Return In Store (BORIS) flexibility. This often drives more calls for Return Merchandise Authorizations, inventory inquiries and appointments for value-added services like installations and customizations. Retail floor employees are often hard-pressed to answer in-depth phone inquiries while serving customers in-store, especially during sales events like Black Friday. Anchor stores or corporate offices are better equipped to handle inquiries by phone, e-mail and live text chat. Even at a corporate level, implementing an on-premises contact center solution is often impractical and resource-intensive to manage. Unified Communications as a Service (UCaaS) and Contact Center as a Service (CCaaS) can scale across hundreds of locations or more at a time, instead of taking hours per location to install and configure. Here are four ways that cloud-based voice and digital retail communications are evolving to support the changing landscape of retail and e-tail. UCaaS is a service model that provides a variety of streamlined communication applications and services. To better explain, let's take "Cynthia" as an example: Cynthia sees a great deal on a television she has been considering for weeks. The sale started a few days ago, so she clicks on the "Contact Us Now" link on the electronics retailer's mobile site. Instead of finding a list of numbers after the jump, she is invited to have a video conversation with an agent, she just has to consent to use her phone's camera. Cynthia quickly explains her interest in the LED TV she is looking for, and the contact center agent explains the location nearest her has two in stock. She provides her credit card information in a secure form on the website to hold the television until she can get to the store and pick it up later that day. Cynthia quickly gets an email confirming her purchase right away which she can provide as proof of purchase. Cynthia chooses to add an extended care plan to her purchase via text chat with another agent while she is waiting at the corner for her purchase to be sourced from the shelf. CCaaS-enabled retail support centers and centralized cloud-based communications like VoIP provide a convenient, responsive first-line of service which helps store associates to better serve the clients in front of them. Where in-store help is required, calls can be transferred seamlessly without interruption. 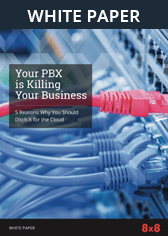 No need to manage onsite PBX hardware or worry about communications failure, because there's no single point of failure. Customer calls can be routed across the country without loss of quality and isn't a burden on corporate IT staff. No need to pay for long-distance calls between locations and every employee can have a speed-dial extension of a common phone number. Omnichannel support centers can support customers via live phone calls, website chat and SMS messaging. Though traditional brick-and-mortar retail is transforming, retailers that stay ahead of the transformation curve are thriving — while those that resist change are failing. Leveraging Unified Communications and Contact Center as a Service technology makes your retail chain more agile, provide better customer service and better understand your customers across in-store and online channels. Retailers that allow BOPIS and BORIS transactions across P&L channels can drive more in-store sales and improve customer satisfaction. 8x8 CCaaS services provide comprehensive analytics which helps retailers to identify where contact center agents and in-store employees can be coached to provide better service. These analytics reports also help management teams schedule their staff based on the volume of calls on online chats.